Fantastic Company, great team, my dog Dixie cant wait to get in and play and is completely exhausted when she leaves. I couldnt be happier using Paws & Play Doggie Day Care!! clean, orderly, professional & they LOVE my dog! My dog loves this place. The staff are caring, friendly, and attentive. Chewie had a ball when he slept over at PnP! It was so cute how they gave us a little report card of what he did. It’s definitely 5 stars for service. Only caveat is that’s it’s a little pricey. Amazing- they take great care of your furry family member! Awesome service... Very knowledgeable staff. I was extremely impressed with what our Sophie learned in such a small time. 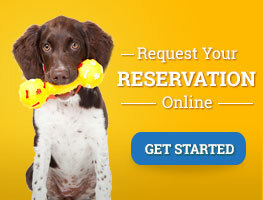 Fantastic doggie day care and extended stay care! Friendly and professional staff! All around awesome place! Whenever work gets involved or surprise vacations, Paws & Play is my only go to spot and I recommend it for anyone who has a pet and want the best proper care, training etc give them a call! Lux & I thank and love you guys! They are always happy to see our little Pepper and he is always so happy to go. Lovely staff and well run facility. This little boy is wiped out after a day of play! Our first time boarding him here and we couldn’t be happier. Absolutely fantastic establishment! My dogs love it there!! People love this place, nice job! Our dog Ruby loves Paws and Play. A first class facility with a friendly, knowledgable, capable staff. I would recommend to any pet owner in need of daily care or overnight lodging. 5 stars! Friendly staff and great facility! My doggo loves coming to visit and he's always well taken care of. Couldn't recommend highly enough!! I recently dropped off my dog Mia after her teeth were pulled out and they were so kind to my MIA, she was in so much pain and the staff tended to her every need! I love paws and play as much as I love my Mia! I love bringing my dog to Paws and Play. The facilities are clean and modern, the staff is so friendly and accommodating, and my dog always seems well cared for when I come to pick him up. What more could you ask for? Highly recommend it! The staff and facilities at Paws and Play are amazing! My dog loves going and I can relax knowing she is in such good hands! My dog Bambi loves Paws and Play! She gets so excited when we pull into the parking lot. The staff is amazing too! Super friendly and professional.I have recommended them to several friends. The place was clean. The price was right. The staff and service was exceptional. We will only continue to use Paws and Play! Super great place! The staff is awesome! And they really love their guests, LOL! Wonderful service, great staff. The only place my dog has ever felt comfortable at. The staff is SO amazing, the place is so clean and our dog has the most incredible experience each time she goes!! Super trustworthy and Just the best!! Highly recommend!! 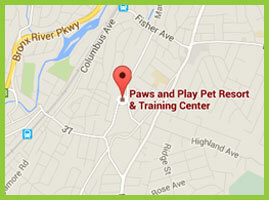 Best pet care place In the 5 boroughs! Our pupper loves Paws! Simply the best! A lovely place to bring your dog. The staff is superb! I am so glad they are there! These guys are so great. This is the only place we'll send our dog Reggie. She always comes home happy and the staff always gush about her and say what a treat she was to have. Very trustworthy people and a great service. The staff is so professional. I can't say enough nice things. The best experience for me and my dog. (And Sue and the staff were so patient with all my phone calls). Our dog Gio loves it there!! The staff is amazing with the dogs!! So friendly, and nice! The facility is so clean! Two giant thumbs up! The staff at Paws and Play is so attentive and caring and the facility amazing. Piper gets excited when we turn on to the street and cries the whole car ride home so she clearly loves it! Paws and Play is a fantastic facility with the very best staff!!!! I can't get my Summer Girl out of the car quick enough in the morning. I recommend without hesitation! My dog Bailey loves it! Staff is super friendly as well. Thank you so much! We are enjoying Jaxson's visits too! He is so cute and just a great puppy! We are excited to be able to watch him grow up with us! My dog seems very happy in the picture taken by the Paws and Play! Made a lot of great "paws"! Thank you!! Sophie had a blast on her first stay. Thank you for making her feel welcome and spoiling her with extra cuddles!!! It was VERY easy for us! She's so sweet and loveable! We had as much fun with her as she did with us! Ryuu loves going to dog camp or boarding. He comes home exhausted. Copyright © 2019 Paws and Play Pet Resort.